Julianne Phillips (born May 6, 1960) is an American model and actress. She began her career as a model in the early 1980s, moved on to acting, attracted attention as the first wife of Bruce Springsteen, and later portrayed Francesca "Frankie" Reed on the television drama series Sisters (1991–96). Phillips was born in Evanston, Illinois and raised in Lake Oswego, Oregon. Her parents are William Phillips, an insurance broker and executive, and his wife, Ann, who raised their children in the Catholic faith. Phillips is a graduate of Lake Oswego High School and Brooks College in Long Beach. She has five siblings: four older brothers and one older sister. She credits her father with getting her into acting and giving her encouragement. Phillips began work as a model in Manhattan in the early 1980s. By 1982, she was represented by the Elite Modeling Agency, which characterized her as a "perfect ten package," earning as much as $2,000 a day. She then moved to Los Angeles, where she appeared in a .38 Special music video. This led to Phillips' acting roles, in 1984's made-for-TV movies Summer Fantasy and the Robert Urich vehicle His Mistress. She also appears at the end of then-husband Bruce Springsteen's music video "Glory Days". Phillips garnered publicity as the girlfriend, and later the first wife, of musician Bruce Springsteen. The two met in October 1984, and they were married in her native Lake Oswego shortly after midnight on Monday, May 13, 1985, surrounded by intense media attention. Citing irreconcilable differences, she filed for divorce in August 1988, which was finalized the following March. Phillips continued her acting career during and after the marriage. She appeared in Odd Jobs (1986), Sweet Lies (1988), and Seven Hours to Judgment (1988), and starred opposite Chevy Chase in Fletch Lives and John Ritter in Skin Deep, both in 1989. Two years later, she began the role of Frankie Reed, the business-oriented character on Sisters; it became her best-known role. 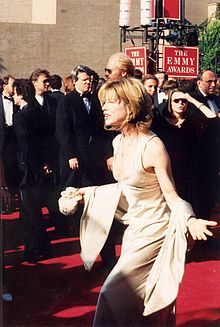 She left the show at the end of its fifth season in 1995, but returned for its final episode in 1996. She then briefly returned to movies, appearing in Big Bully (1996), Colin Fitz Lives! (1997), Allie & Me (1997), and the made-for-TV disaster film Tidal Wave: No Escape (1997). Phillips has not acted since 1997. She has been seen in the public eye on few occasions since then. The first was in 2001 when she was interviewed on an episode of the biographical documentary series Intimate Portrait that profiled her Sisters co-star Sela Ward. The other was in 2014 when she was reunited with former Sisters co-stars Ward, Swoosie Kurtz, and Patricia Kalember for a special edition issue of Entertainment Weekly. The reunion was documented on the NBC morning news program Today. ^ a b c d e Dave Marsh, Glory Days: Bruce Springsteen in the 1980s, Pantheon Books, 1987; ISBN 0-394-54668-7. pp. 303, 316-18. ^ For now, per reliance on Talk:Julianne Phillips. ^ a b Greenwald, David (March 18, 2016). "Flashback: Bruce Springsteen's Lake Oswego Wedding". The Oregonian. Retrieved June 13, 2018. ^ , people.com; accessed October 29, 2014. ^ Willistein, Paul (March 12, 1989). "A Calm Eye In The Storm Julianne Phillips Won't Pay Price Of Privacy For Success". Morning Call. Retrieved June 13, 2018. ^ Meyers, Katie. "Whatever Happened To Julianne Phillips". ew.com. Retrieved June 13, 2018. ^ "Intimate Portrait: Sela Ward (2001)". tcm.com. Retrieved September 1, 2017. ^ Marcus, Zoe. "It's been 18 years! Get back together with the cast of 'Sisters'". today.com. Retrieved September 1, 2017. Julianne Phillips profile, NNDb.com; accessed October 29, 2014. This page was last edited on 19 January 2019, at 23:09 (UTC).